Opening Weekend at Saratoga is finally here! 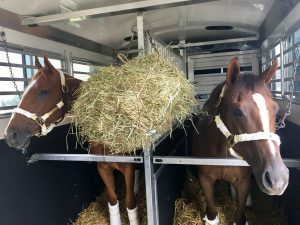 Our girls made it to The Spa safe and sound, and we can’t wait to see what’s in store for them this weekend. Find out more about Opening Day here. 2YO filly Southampton Way (Into Mischief – Roadtohanna) will be running in Race 5. Post time is 3:14 p.m. and you can view entries here.You may even remember Southampton Way as last year’s Yearling Show Grand Champion! Read more here. 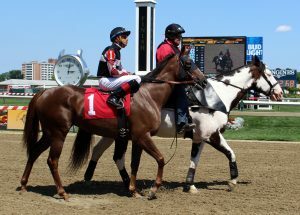 3YO filly Chubby Star (Malibu Moon – Salsa Star) will be hitting the turf in the G3 Lake George Stakes. Post time is 5:40 p.m. and you can view entries here. 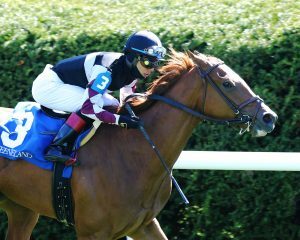 Chubby Star is off to an excellent start in 2017, winning at Keeneland in April, finishing in a close 2nd in the Murphy Stakes on Preakness Day against the boys, and finishing strong in 4th against a competitive field in the G3 Regret Stakes at Churchill Downs. 5YO filly Ginger N Rye (More Than Ready – La Milanesa) will be running in Race 9. Post time is 5:40 p.m. Stay tuned for information on entries. Follow us on Facebook, Twitter, and Instagram for updates from Saratoga this weekend. Can’t make it to Saratoga for Opening Weekend? Join us for Equestricon in August! Learn more here.